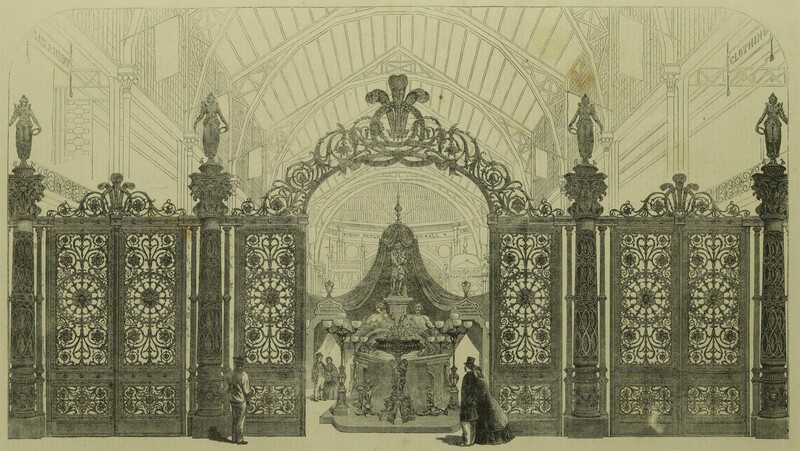 When the Coalbrookdale Company exhibited a lavish set of ornamental cast-iron gates at the International Exhibition in London in 1862, they were building on a well-established reputation for ‘artistic’ castings. Celebrated by the Illustrated London News as ‘pure and rich in character’ (1), these gates were probably created as a gift for Queen Victoria to guard her rural residence at Sandringham; evidenced in their combining of highly naturalistic motifs – flowers and leaves – and the Prince of Wales’s feathers braided in a wreath of laurels over the centre of the gates. The eminent Victorian sculptor, John Bell, designed the figures standing atop the pillars as well as some of the other Coalbrookdale exhibits shown behind the gates – a statue of Oliver Cromwell and an ornamental umbrella stand. In the event, it seems that the Queen snubbed the offer of the gates for her Sandringham estate – the story being that, on seeing the gates at the Exhibition, she took offence at the nearby statue of Cromwell and, by association, decided that all the Coalbrookdale Company’s products might be tainted with republican sympathies. After the Exhibition, the gates and the Cromwell statue went back to Coalbrookdale and languished there in a warehouse for many decades. Yet, both objects had an afterlife. In 1893, Frederick Monks, a wealthy iron founder from Warrington, discovered the gates at Coalbrookdale and offered them as a gift to his home town. They were re-erected at the entrance to Warrington’s town hall, the royal regalia replaced with the heraldic motifs of the town (2). 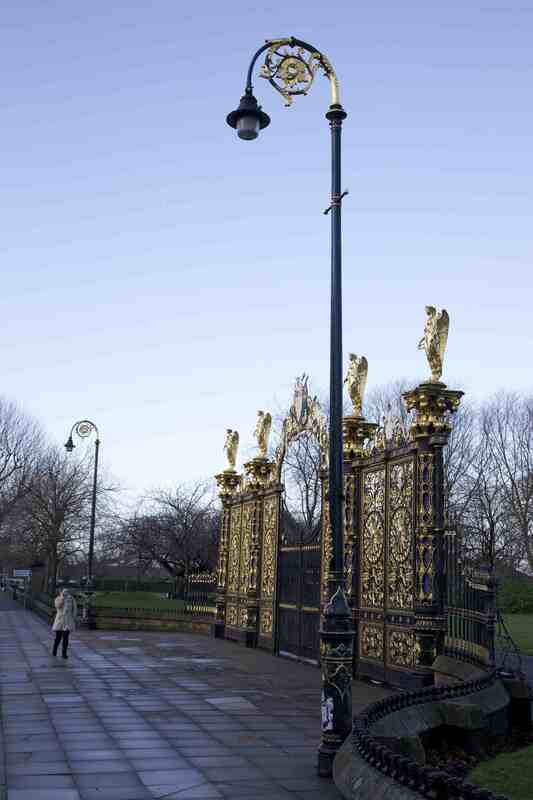 At the same time, the Glasgow iron founder, Walter Macfarlane, erected many ornamental lamps in the town, including two flanking the gates, as well as a new railing extending around the park surrounding the town hall (3). 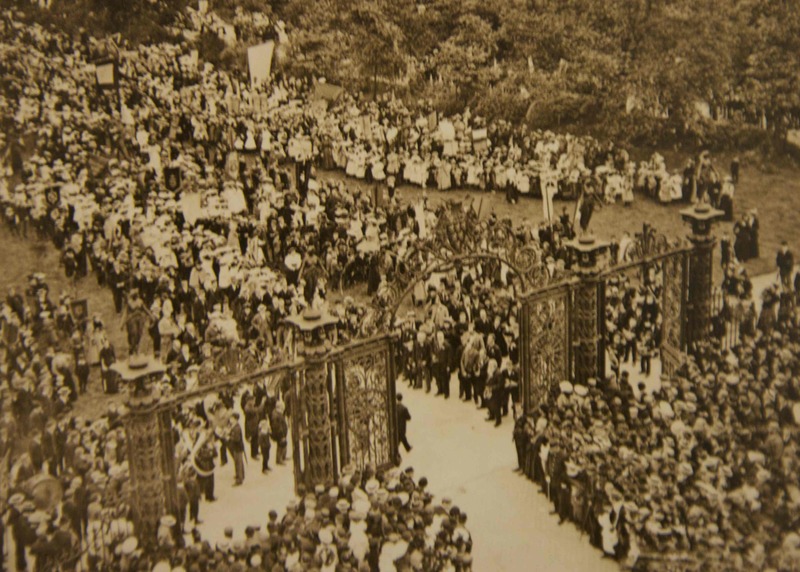 With a great deal of civic ceremony, the gates were opened on 28 June 1895 – the date of Warrington’s most important annual festival, Walking Day, when garlanded children paraded around the town in a visual spectacle of civic boosterism (4). The gates quickly became a source of local pride, the product of an act of personal philanthropy that provided an aesthetic and decorative reference point in a disheartening urban landscape. 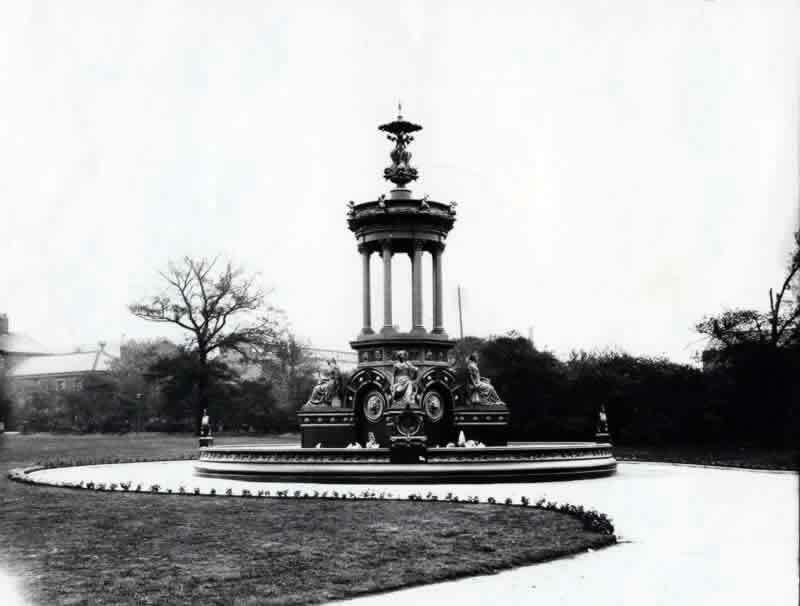 They also proved to be a spur for similar acts of public giving and Monks himself bought the Cromwell statue for Warrington in 1899, with another local bigwig, Sir Peter Walker, donating a lavish ornamental cast-iron fountain, made by Macfarlane and installed in the park beyond the gates (5). Yet, the story doesn’t end there. For, in March 1942, all these cast-iron objects were at the centre of a fierce debate when the War Government required that many towns and cities remove their cast-iron fittings to be reconstituted as munitions. It seems that the citizens of Warrington willingly gave up the ornamental fountain to be melted down but resisted attempts to do the same to its railings and gates. Residents objected to the brutal assault on their private property and the mess that was often left behind. While many of the town’s gates were being made into guns, the Coalbrookdale examples survived, perhaps because they now represented the town as a whole, rather than any one individual; and they continue to do so today, providing a vision of luxurious abundance in an otherwise rather nondescript post-industrial townscape (6). Really admire how you excavate the layers of history accumulated upon material (and sometimes almost invisible) culture. Thanks for this. That’s exactly what interests me about cast iron – it has this quality of accumulation about it, whether visible as rust or decay, or in the way objects are often reconstituted over time. 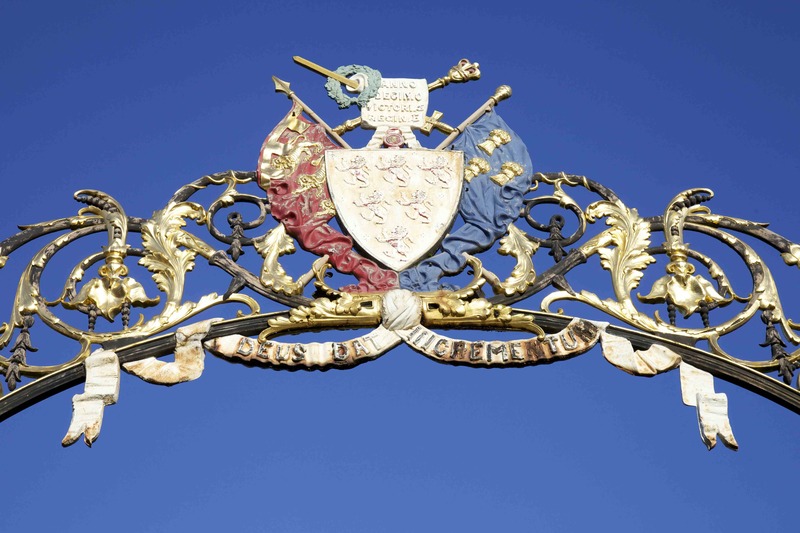 From the original engraving, it is evident that the gates originally had the Prince of Wales’ feathers atop, not the royal coat of arms, which would make sense, as Sandringham never belonged to Queen Victoria but was a private house belonging to the future Edward VII. Otherwise a fascinating story and a wonderful artefact! Thanks for the correction! The gates actually chosen for Sandringham were also shown in the 1862 Exhibition & were made in Norwich by Barnard & Bishop. 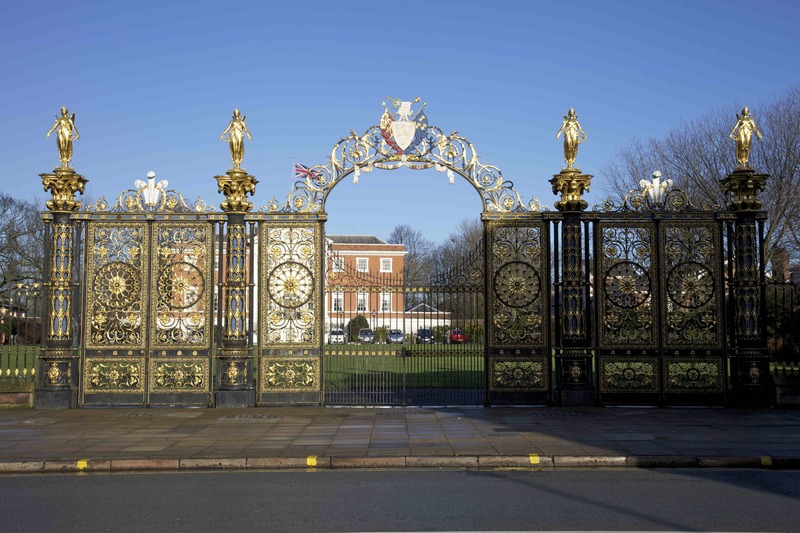 I research local history in Warrington and the gates and the town hall are a large part of one of the talks I give. Do you hold the copyright on the photos 1 and 4 above? If so would you give me permission to use them in a talk please? If not, can you tell me who does? Many thanks. Sure, they are my photographs and you’re welcome to use them in your talk. Thanks for asking! Sorry, 1) is an image from the Illustrated London News and is out of copyright so you can use it. 4) is from the local history archives in Warrington (I’m not sure from which publication), but the photo is more than 70 yrs old so should not be covered by copyright law.